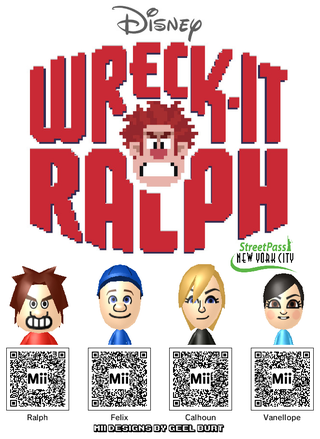 Jordan White, the founder of StreetPass NYC (a 3DS meetup organization) sends along these four Mii QR codes from Wreck-It Ralph, which released on Friday. If you want to trick out your Mii like one of the film's characters, there's Ralph and his adversary Fix-It Felix, plus Sgt. Tamora Calhoun from Hero's Duty and the kart racer Vanellope van Schweetz. [Click on the image to expand it so you may scan in the QR codes].